Make your child's Godparents feel special. This personalized keepsake can be given to the Godfather and/or the Godmother on the baptism day or as a special "any time" gift from their Godchild. A Godparent plays a very important role in the life of a Godchild. 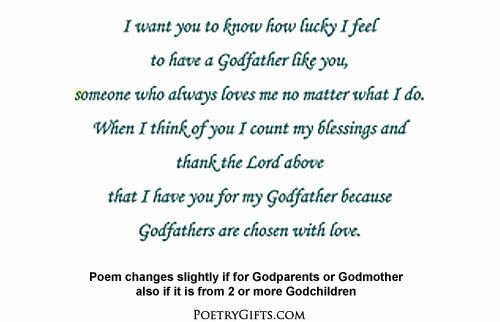 Let your child's Godmother or Godfather know how special they are with this beautiful Thank You For Being My Godmother/Godfather/Godparent Poetry Gift. 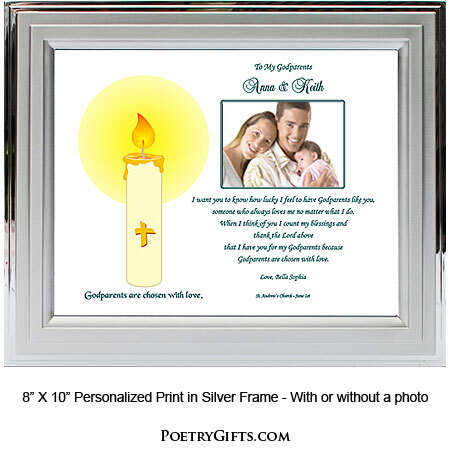 It is a perfect way to commemorate your child's Baptism or Christening day. 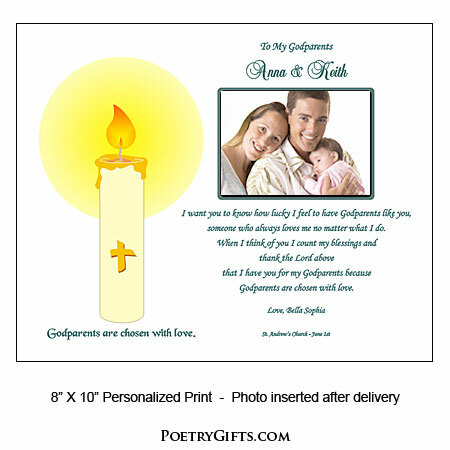 The heartwarming poem can be personalized with names, Baptism date, the church and a loving message. Add a favorite photo in the cut-out area and you have a very unique keepsake for a Godmother or Godfather that they will surely treasure. Fill out the personalizaton questions above to order your Poetry Gift. Examples of answers are listed below. 3. Closing Phrase and Godchild's Name(s) (as seen after poem) - Examples: Love You, Hailey; With Love, Hailey & Josh; etc." 4. Optional Church and Date - Examples: Holy Family Church - June 1st; St. Theresa's Parish - September 30th, etc." Godparents are chosen with love. There is no need to send us a photo. 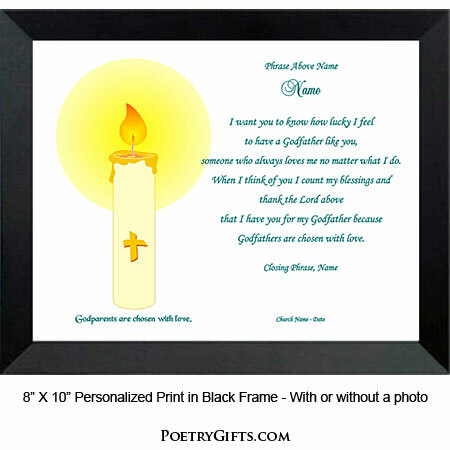 You or the gift recipient can easily add a photo after the Poetry Gift arrives. The photo is taped on that paper and positioned so that it is in back of the opening. You have the option of attaching a photo before you give the person the gift or the person receiving the gift can easily tape on their photo.